There are a lot of Bibles that come packaged with devotional or study material and sometimes it can seem like nothing more than marketing. 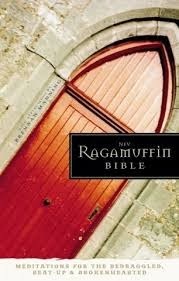 But as soon as I heard about the NIV Ragamuffin Bible, I knew it would be something special. The writing of Brennan Manning is very special to me and I think has been to many a discouraged Christian. This is a hardcover Bible that includes snippets of devotionals and quotes and reflections from Manning throughout the text. It's not a study Bible and shouldn't be confused with one, but it might be a special Bible to have anyway! It "offers a collection of Manning’s raw, painfully honest, yet grace-filled devotions, meditations, and reflections of his journey limping back to---like the prodigal son---his overjoyed father." I haven't read the whole thing, obviously, but I have looked through it and it's lovely. I received a review copy from the publisher.